Well, then. I should say they aren't "making" the movie yet—they're Kickstarting it. But after a couple days on Kickstarter, the project is more than halfway funded… and I have just a sneaking suspicion that it'll hit its goal. 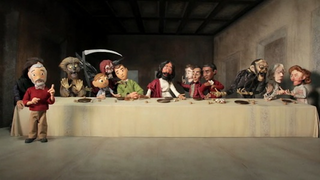 The video on the Kickstarter page tells the whole story of the film Anomalisa, throwing back to Harmon's great-looking (though kinda uneven, if you ask me) stop-motion Christmas special episode of Community. The video also gives a sense of Harmon's maaaaybe kinda pissed-offedness after his rocky ouster from Community after the end of the last season (though hey, at least he's probably beaten Prototype 2 by now!) They also mention that if they raise more money, that they might do a project with Louis C.K. and TV Funhouse's Rob Smeigel, which… well okay, I'm interested in all of this! Is this the kind of project you would fund? Do you love The Nightmare Before Christmas as much as I do? Can you even imagine what a headache it must be to make a movie using stop motion miniatures? Feel free to discuss that Feel free to discuss that, or whatever else, here or over in the Talk Amongst Yourselves forum. Have good chatting, see you on Friday.